Lions Are Much Like on Steroids! If you're looking to gain massive biceps or triceps, look no further than the life of a lion. Lions generally take down twice as large prey if not larger and no other land predators can take down as massive an animal as a giraffe and even rarely documented cases of adult elephants killed by lions. On top of being overly ambitious, it does also come down to the impressively toned muscle lions have. You might agree with me that there's no possible way if you put yourself in a predator's shoe, take down something weighing twice or four times your weight if you got flimsy muscle mass, its impossible. If you look all over, almost everyone thinks that because the tiger is the largest cat then, therefore, they have the biggest muscles but I personally disagree because just like people you can't say that a 250lbs guy necessary has more muscle than a 200lbs guy, the smaller guy could be more ripped with more muscle mass than the bigger guy. Tigers are awesome but as far as all the images I have seen, their muscles, unfortunately, aren't as ripped as most images I have seen for lions. Most people love cats but if you want to capture some fire within you and you're looking to watch something intense, maybe dangerous and mysterious, then you know for sure that the complex life of lions is it, it's like a scripted movie and no other cat in the wild offers that. Enjoy the video below, a bodybuilder's dream. It's so Cold in Washington State that Deers Visit A Vet Clinic! 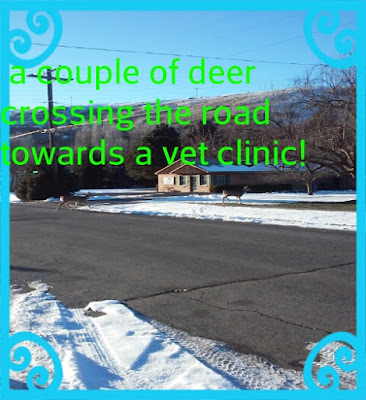 In a small town in eastern Washington state, a couple of deers went back and forth surrounding a small vet clinic! They appeared puffed up most likely from their furry bodies trying to fight back the negative degree temperatures but what's even more bizarre is the fact that they stayed for a while next to a vet clinic. They must be a smart couple of deers to know that if they did freeze their behinds then there's no better place than right next to a vet doctor.